he interior design of a period house based on historic style must be a careful endeavor as this is the most important aspect of a luxury house. 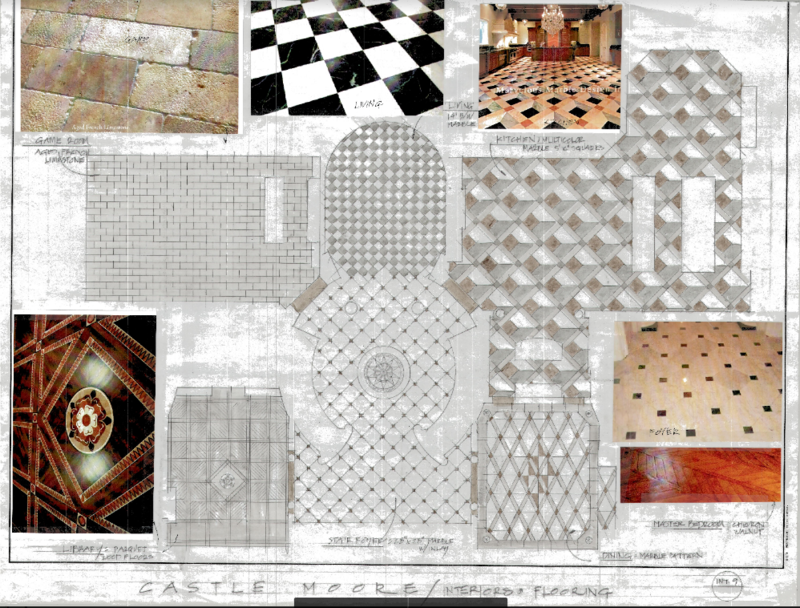 The interiors of a French style, Italian villa, or Gothic/Tudor must reflect the same materials and details in flooring, wall and panel treatments, ceiling ornamentation, arch geometry and column type. Moldings in particular should be matched to the style you are creating. The design of interiors of a luxury house begins with a floor plan layout that is organized in a manner that is reminiscent of the period style you seek to emulate. Most historic houses were NOT open plan type but had distinct rooms that were typically not visible unless doors were opened to reveal the contents. This is one rule that must be gently broken for the contemporary mansion as the size and scale of mansions today are not the same. We have to scale down the enormous sizes and heights of rooms that are found in historical examples to adapt to modern lifestyles. The rules of the Renaissance and Period Revival architecture were always observed in the 18th to 20th century construction of villas, mansions and castles. Assuming a well laid out floor plan that solves functional and aesthetic points we turn to the actual surface treatment of 6 planes of EVERY room of the house: 4 walls, floor and ceiling. ​Like the human body when adorned, there should be effort made to highlight the most important focal point in each space whether fireplace, bar, library wall, decorative windows, etc. A decision must be made on the general height of floor to ceilings in all rooms. There can be double height spaces but the average height of rooms is based on width and length in general. 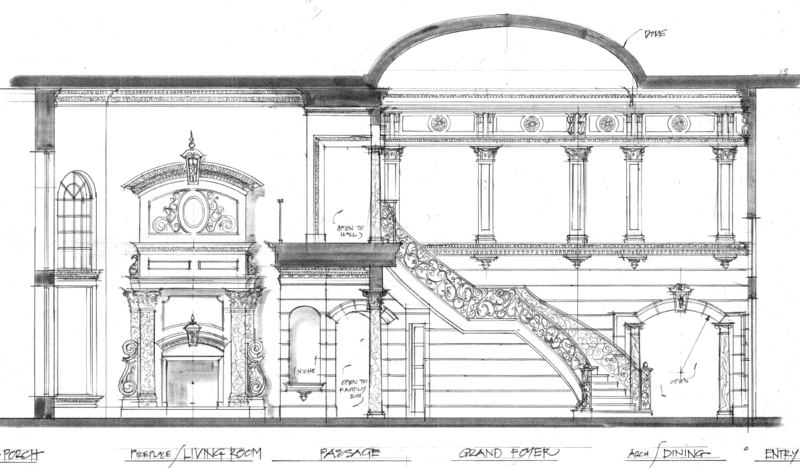 Palladio and neoclassical architects used special formulas to establish the perfect space. A golden section was employed in many cases. The actual interior design process involves drawing each wall of each room/space by blocking out the height and width and noting openings, projections, and other general features. 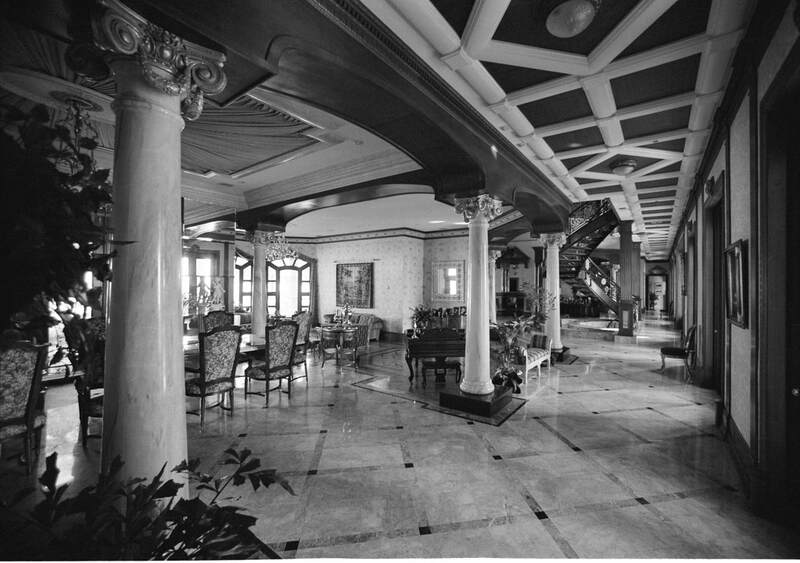 If formal rooms are connected and open to central hallways and a Foyer for example it is better to see the entire connected space on paper when 'building' the details of the interior wall elevation. Proportions of moldings, panels, ceiling crowns, and other elements should be blocked out and then drawn in with more detail. A French palace has different details than a French country house; an Italian Villa or palace of great spaces has a more elaborate decorative scheme than a smaller Palladian structure. Most important is to be cognizant that molding design is specific to a style and that they should not be mixed. In the most simplified design moldings for all Formal rooms can be of similar design and secondary rooms, for example bedrooms, can share the same molding. But a luxury house will normally have special and different moldings for the Foyer, Living or Great Hall, Dining, Kitchen, Master Bedroom, Secondary Bedrooms and down to Powder Rooms and Laundries, etc. 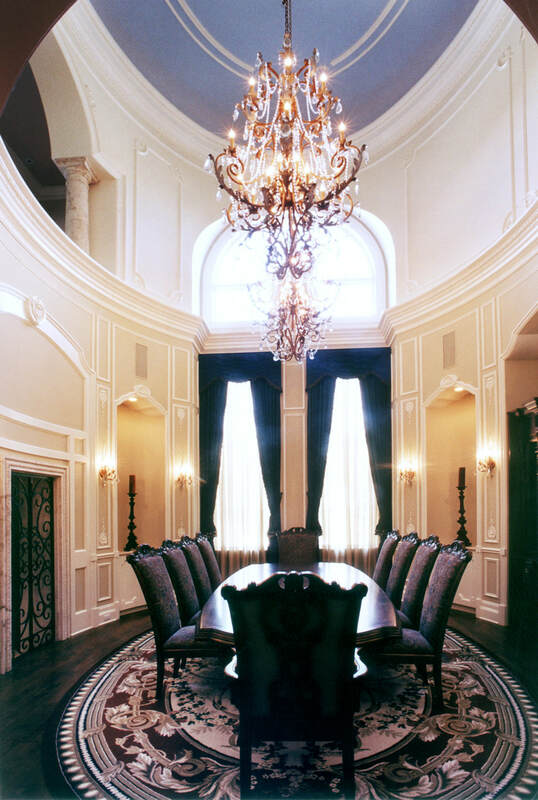 The most elaborate interior treatments are dedicated to the formal rooms and become less intricate as the rooms are important. There is no need for overdone moldings in minor spaces unless they are focal points in a larger room. It would be wonderful if we were still in the age of Stuccadores, tradespeople who actually ran plaster on plaster walls and made all the decorative elements on site. You can still find trades in Europe available for this effort and quite worth their fees but costs may be prohibited for a medium sized luxury house. Premanufactured moldings are the biggest 'bang for the buck' in modern times. Synthetic plastic and hybrid plaster cast decorative elements are available from multiple sources in this country and can be mixed with real wood moldings painted to simulate any finish. Ceilings should be as decorative or more so than walls. Consider the importance of spacing electrical lighting within the pattern of beams and crown and other moldings. Stone and wood floors are important to match to the interior elevations of every space. Interesting patterns and bordering with accents, sometimes using lasers or high pressure water are readily available. ​Door handles, light and plumbing fixtures should be in historic styles as well. Try to avoid any contemporary accessory mixed with period style decoration. Push button lighting controls are a good option to flip switches and plastic panels. Proper color selection between wood, stone, and interior panels, moldings, etc. is the final touch to a great luxury house interior. Pale colors on walls and ceilings seem more elegant but Tudor designs have stronger splashes of color. Keeping in mind the more open plan nature of contemporary houses you will see many rooms at once or at the same time in close proximity. For this reason strong colors from room to room may not blend well in the overall impression. Specialty color schemes are best left for rooms that can be closed from view. Finally... furniture. There are contemporary manufacturers of chairs, tables, and accessories that are period interchangeable. Not as important as the interior architecture to be consistent, nonetheless furniture must be carefully considered to find pieces that fit the scale of the rooms. Custom built pieces are an option that may be required if specific period furnishings are not available. A final note: forced air and heat should be kept hidden as much as possible or embellished with decorative grills. Floor registers are best used when possible. The ceiling registers by contemporary manufacturers completely ruin the intended effect.